Christmas stocking for a parakeet. Acme Pet Products Corp., Pelham, New York, 1950s or early 1960s. 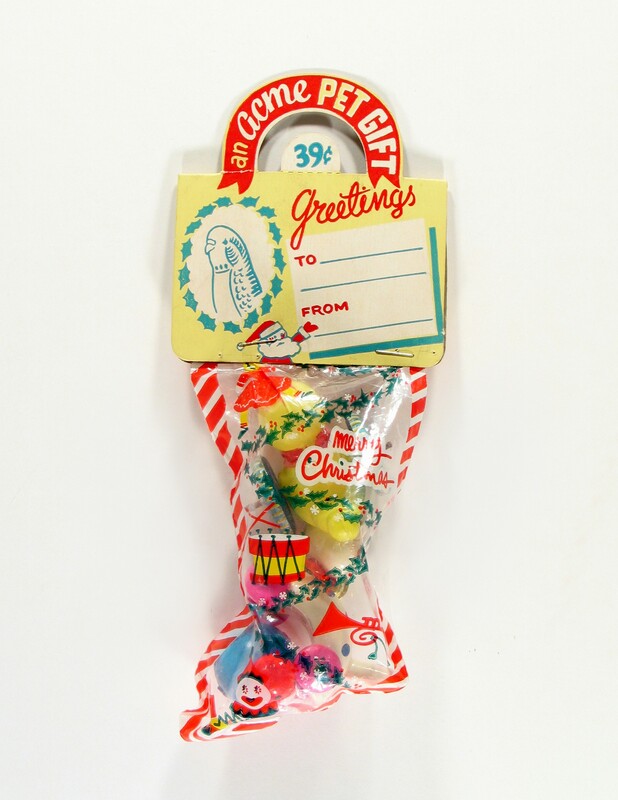 About ten years ago I had the chance to purchase this unopened Christmas stocking intended as a gift for a parakeet. The contents consist of two rolling toys on wheels, one made of wood, and a roly-poly plastic bird. I don’t know how long the plastic bag will survive, but it seems to be holding up well for now. The roly-poly ‘s head has broken. Eventually I may have to disassemble this item for better long-term storage. Parakeets enjoyed a surge in popularity in the 1950s and early 1960s. At the Woolworth’s five-and-ten, I used to look at the cages of cheerful, squacking yellow, green and blue birds longingly. My mother was not a fan of birds in the house, although just about anything with fur was acceptable. Parakeets like toys, and their cages were often well-stocked with bells, mirrors, roly-poly toys and other items. I’ll write more about parakeet pets, including efforts to teach them to speak, another time. For now, it is enough to note that pet owners could spend 39 cents at the five-and-ten or the neighborhood pet store to give their feathered friends a Christmas stocking of their own. Merry Christmas! If you would like to share information on the gifts you are giving your pets this Christmas, please feel free to add comments below. Next Happy New Year from Nix…and me.